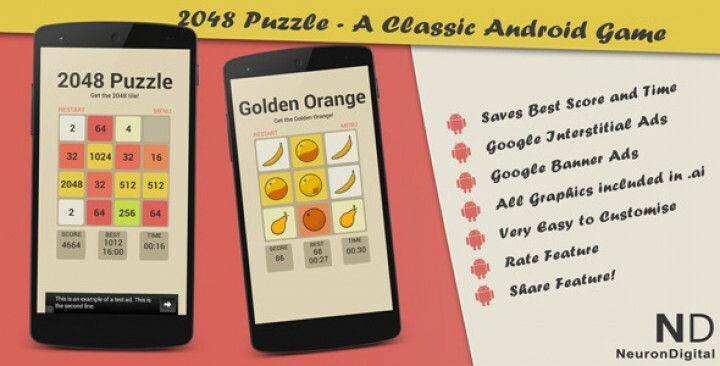 This is a template for the classic 2048 number puzzle game, which can run on Android devices. The template is designed to be edited with eclipse, having Android SDK installed. The aim of the player is to swipe Up, Down, Left and Right to move the tiles/Cards around the board. Matching Cards will merge together to create a card with their total. The game is won when the maximum card is reached. All of the code you would need to change to do a standard customisation is all put conveniently in one file, Strings.xml for easy customisation. Menu Feature – Player can open Menu During gameplay, pausing game. Best Score – The game saves the Best Scores on the user’s Device. Restart Feature – Player can restart game. Timer Feature – Time how fast will the player finish the game. The music and sound fx are not included in template. You need to use your own.